To those who celebrated, I hope you had a great, Happy Canada Day! This photo (above) has been reminding me for nearly two weeks now to post this recipe and it’s also been making me insanely happy with my photography and very enthusiastic. When Lauren mentioned how she was going to make her millet biscuits and turn them into strawberry shortcakes, I developed an interest in the biscuits. After some correspondence back and forth (asking if cornstarch would be a suitable substitute, and if white rice flour would work in place of the sweet rice flour – since having run out from making multiple apple tarte tatin puffed pancakes), I commenced to roll up my sleeves. 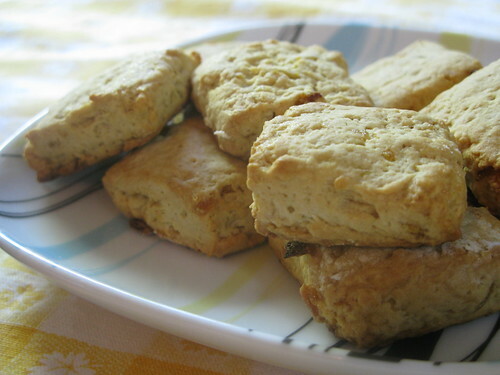 Now, when I think of biscuits, for some reason, I associate them as the British cookie-like baked good – or treat? – never the American. I felt my brain adjusting its notion of what it thought Lauren’s biscuits were after seeing what they looked like. (Just an illustration of how important visuals can be in food blogging or any food writing, no?) I was theoretically already tweaking the recipe and essentially making my own version. I don’t always follow through with recipes, sometimes I see a recipe and a whole new one is born right out of it upon reading it. I’m just wired that way, it seems. When I made the Meyer lemon curd, I couldn’t bring myself to throw away the rinds, so I saved them with plans to use them for something else and these biscuits were the ticket. I used a combination of Meyer lemon and regular lemon zest, although it could be made with just Meyer lemon or just regular lemon. These biscuits are buttery and solid, with just the right about of zing from the candied lemon peel. They’re great with tea, or eaten on their own, with or without some of the syrup leftover from cooking the lemon peel drizzled over. Lauren suggested substituting the tapioca flour with cornstarch in weight (4.65 ounces) rather than cup-by-cup. 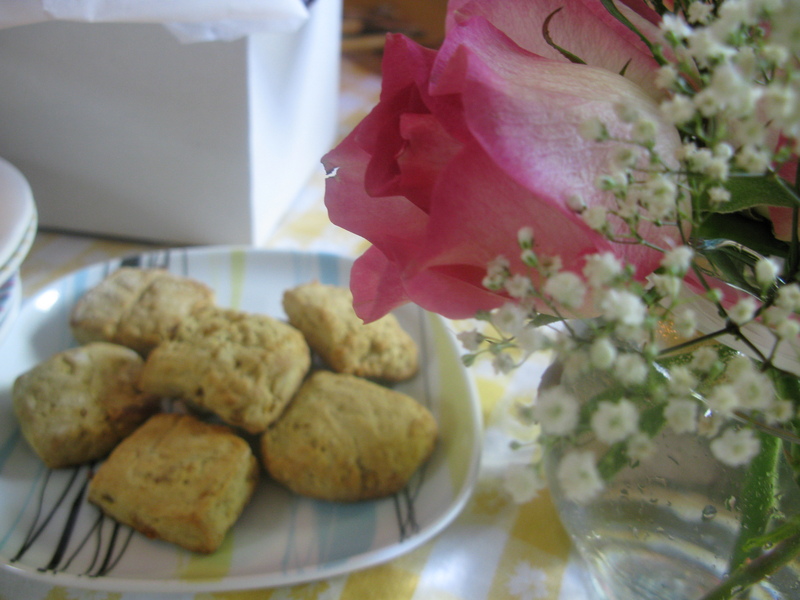 I made a half recipe of these biscuits, although my scale isn’t that technical and it only went up to 2.9 ounces, so that’s what I worked with and it still worked out. Unlike traditional baking, gluten-free flours aren’t always the same weights, which is why, in addition to other factors, if you try substituting one gluten-free flour for another gluten-free flour in volumes, it doesn’t always work out. This is something that Amy discussed a while ago in this post. (The only thing I consistency weigh in recipes, so far, is chocolate.) If you do have tapioca flour, though, of course you can use that instead. If using white rice flour, you may want to whizz it in the food processor to make it fine if it isn’t already. I used coconut milk in place of the buttermilk. If you can manage dairy, I’ve also made the biscuits with butter, but room temperature instead of cold (wasn’t paying attention to instructions) and they still worked out. 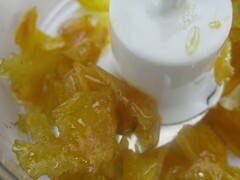 The candied lemon peel can be made in advance. Cut off the peel from the lemon rinds, with as little pith as possible. You’ll have about 2 ounces. Bring water and honey to a boil. Lower to a simmer and put in the cut lemon peel. Cover and simmer for 1 hour. 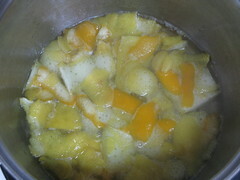 Once the peels are cooked, remove from pot and whiz in a food processor or small food chopper until it’s finely chopped. Save the leftover syrup for drizzling on the biscuits (reheat first in order to do so, as the syrup sets quickly after cooling). Preheat oven to 435ºF and line a baking pan with parchment paper or wax paper. Lightly grease the wax paper, if using. Mix the dry ingredients together and add coconut oil oil, cutting with a fork (or pastry cutter) until balls about the size of small peas form. Pour the coconut milk into the dry ingredients, stirring until it just starts coming together. Mix in honey and chopped, candied lemon peel. 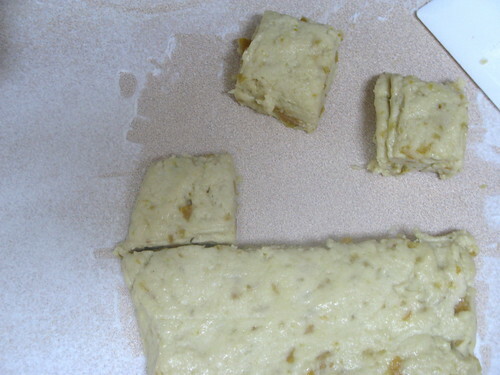 Turn dough on to a well-floured surface and pat into a rectangle that’s about 1-inch high. Cut into squares and flatten slightly, reshaping if necessary. Place on prepared baking pan and bake for 15 to 25 minutes. Cool and enjoy! That Meyer Lemon is addicting! I really enjoyed the taste of these and I prefer them when they are first made as they are nice and softer then because they do tend to harden. Have you tried using them as a shortcake base with fruit or a fruit compote? I was curious how they would work for that. These look and sound delicious! Love that you’ve made a non dairy version. It gives me hope for my future with biscuits! Looks like your Lemon Biscuits turned out perfectly. Waw!! 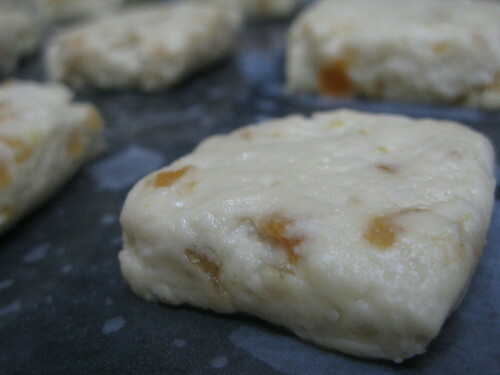 These lemon millet coconut cookies look like the real thing!! They look so mighty tasty too! Another great recipe, Zoe! I’m imagining them with tea. 🙂 Love that you saved the rinds until you came up with an idea. And that first photo is beautiful, but all are good and I love the last one, too.